The conversion process creates a new copy of the database in the new format, without altering in any manner the original database. For example, if you convert a database named MyDatabase.dtbx , the conversion will create a database named MyDatabase.hbmp which is a new independent copy, in the new format. Note that the new database may be considerably smaller in size than the old format thanks to the new optimized compression algorithm. a new database is created and the data-dictionary data is converted : entities definitions and contents, cube definitions, DataReaders, rules, security profiles. all extracted files are automatically reloaded in the new HBMP database. The conversion process may take a few minutes for small databases, of a size of 1 GB or less or it may take several hours for large databases, of 10GB or more, depending on the performance of the hardware. Two progress bar indicate the processing of the two lengthy steps of the conversion, the extraction of data from the old database and the loading or data into the new one. Note that since the conversion requires to extract all cube contents to files, it is necessary to run the conversion on a computer with sufficient free disk space (two to three times the size of the database or even more). The conversion of a Board 7.3 database to HBMP, must be executed on a 64-bit operating system. Install the HBMP Converter program by running the setup program on a computer where Board Server is installed and configured. 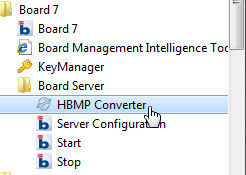 The HBMP Converter program is installed in the Board Server program group. User Name / Password : set a valid Board user account with full privileges on the database to convert. This account will be used to open the database for conversion. Board Path : set the Board directory where the Board databases to convert are. Run the HBMP Converter program, configure the required parameters as described above then select the database from the drop-down list and click the Convert button. The process can take several hours to complete. If the database being converted is large (over 10GB in size) ensure that the computer doesn't run out of disk space and that the RAM consumption doesn't exceed the physical RAM of the server. At the end of the conversion process, you can free some hard disk space deleting the text files which the conversion program creates under Board\Dataset\dbname. - reducing the number of versions also reduces the amount of RAM required to run in in-Memory mode which gives even more performance. - review the sparse structures: it is recommended to use 64-bit sparse and not 128-bit sparse. Since the HBMP engine provides higher compressions on non sparse entities, it is generally better to have 64-bit sparse which are faster than 128-bit sparse structures even though implies setting one or more entities to non sparse. - a general review of the database may be required to fully take advantage of the new potential of the HBMP engine, which can handle higher volumes of data, at more granular level and server a larger number of users.